A new app has hit the mobile phone market, which offers up a whole load of functionality from Microsoft's Office suite through your handset. Available for Android, Bada and iOS phones, the application brings the likes of Word, Excel and PowerPoint to your phone, allowing you to view and edit your Office documents on your mobile. At the moment, Picsel Smart Office can boast about being the only document editor available on the Apple App Store and the makers of the app have tried to make it as easy as possible to view and edit docs. For viewing Word and the like, the app automatically resizes content into an easy scrollable format and there's also a carousel style viewer for multiple documents. For those that want to tinker with docs on their mobile, Picsel Smart Office offers a full editing suite. So you can bold up words, underline, change fonts, change size, and save in original format. For added gimmick Picsel Smart Office also has 3D functionality, which means you can view the content in 3D if you have a stereoscopic screen or in anaglyph on a standard screen. Not sure if we would want to see an Excel document in 3D, but it would work pretty well for PowerPoint. While Windows Phone 7 is, understandably, offering up very good Office functionality on Windows handsets, Picsel Smart Office sounds like it is scratching those hard to reach places QuickOffice can't quite reach. 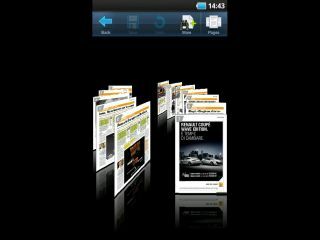 Picsel Smart Office is available for download on the Apple App Store, Android Market and Samsung Apps for £5.99 now.